As announced earlier today, McGill has received $1.65 million through NSERC’s CREATE (Collaborative Research and Training Experience) initiative to develop a multidisciplinary training program in the fields of physics, biology and medicine. The Medical Physics Research Training Network (MPRTN) will provide internships, mentoring and training opportunities for the next generation of medical physicists that will nurture collaboration while also addressing the need to put new technologies into clinical practice. 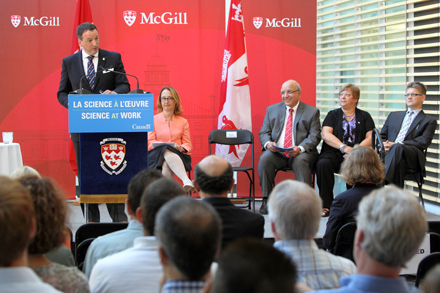 From left to right: the Honourable Greg Rickford, Minister of State for Science and Technology; Rosie Goldstein, Vice-Principal (Research and International Relations); Anthony C. Masi, Provost and Acting Principal and Vice-Chancellor; Isabelle Blain, Vice-President of Research Grants and Scholarships at NSERC; and Prof. Jan Seuntjens, co-director of the new Medical Physics Research Training Network, at today’s announcement. / Photo: Owen Egan. Even though most people would be hard pressed to name a single medical physicist, almost everyone has benefitted at least once in their life from the innovations made by these researchers. Ultrasounds, X-rays, CT scans, MRIs and nuclear medicine are only a few examples of the essential contributions made to healthcare by medical physicists. As announced earlier today, McGill has received $1.65 million through NSERC’s CREATE (Collaborative Research and Training Experience) initiative to develop a multidisciplinary training program in the fields of physics, biology and medicine. The Medical Physics Research Training Network (MPRTN) will provide internships, mentoring and training opportunities for the next generation of medical physicists that will nurture collaboration while also addressing the need to put new technologies into clinical practice. It might not make any medical physicists a household name, but it will significantly enrich graduate education in the field. The MPRTN funding is just one of a host of new training initiatives in a variety of research areas, including genomics, climate change in the Arctic, clean combustion engines and wireless technologies, that will be supported by NSERC’s CREATE program. In all, the Federal Government will invest more than $24 million over six years in 15 initiatives to help science and engineering graduates add valuable job skills necessary in today’s labour market to their academic achievements. “Our Government firmly believes that science, technology and innovation [along with] cooperation from all sectors, whether it is private, industrial, academic or government sectors, underpin the modern economy and are essential to shaping Canada’s growth and long-term prosperity,” said the Honourable Greg Rickford in his first official announcement as Minister of State for Science and Technology. For Anthony C. Masi, Provost and Acting Principal and Vice-Chancellor of McGill, the CREATE funding of the MPRTN is not only good news for medical physicists, it is great news for patients.